In 2008 I picked up the self-titled Friendly Fires on sale from the now-defunct Virgin Megastore. It was one of those albums that I purchased based solely on a quick track scan, like a musical scavenger picking at the tasty surface meats that hung off of a delicious downed animal. But, it wasn't nearly as disgusting as that makes it sound, obviously. Mostly, I was instantly enamored with the super-catchy punk-dance beats and quality hooks. It was something that I hadn't usually gravitated to at the time, but now informs the majority of my taste. It's Britpop, it's funky and it's fun. And it's a lot like Chinese food, at least based on the common parable, it can be easily enjoyed and heard, but often leaves only a small lasting impression, requiring repeat visits to taste it again and again. 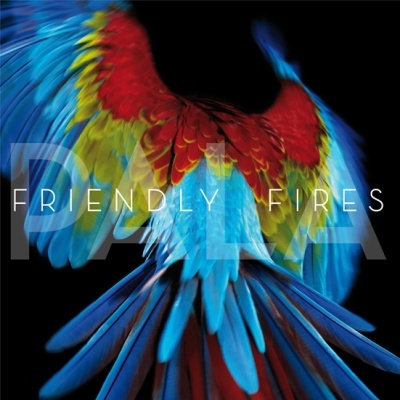 Three years later, Friendly Fires returns with Pala, an album whose name comes from the Aldous Huxley novel Island, wherein a journalist is shipwrecked on a fictional island called Pala. In a lot ways, Pala feels like a shipwreck. Not because it is disastrous or flawed, but because it lays the travel and island references on thick, and while the music remains fun enough, it also may as well be deserted. Hearing it at first is a great experience of solitude, but some of the songs are so short that they lack proper sustenance. I imagine being stranded it that way. First, "Yay for freedom." Second, "Boo for lonely emptiness." The opener "Live Those Days Tonight" is solid, peppy and somewhat innocuous. Not nearly the powerful starting track that "Jump In The Pool" was to the first album. "Blue Cassette" is intentionally lo-fi, telling a story about an old cassette that touches on nostalgia and rumbles enticingly with heavy-hitting drums and quality, echoing vocals. "Running Away" trickles and runs on funk with a touch of clanging bells. It's a fine track, but melodically seems to never quite grab the upper echelon of pop that it nearly reaches for, like the kid in gym who could never quite reach the top of the rope (and I was that kid several times so I know). "Hawaiian Air" is decent, sweet, but somewhat mediocre, trying to paint a sort of island-pastoral concept, but never completely succeeding. Finally, with "Hurting" the album reaches a level of lyrical maturity and compositional difficulty that really makes an interesting track. The repetitive synth and airy vocals, with some blue-eyed soul vibe sprinkled in, really makes the track feel like an '80s pop gem, but with enough complexity to feel new and bright. "Pala" also brings something interesting to the table, drawing on pseudo-darkness combined with bird sounds, camera clicks and shutters, to decorate a conceptual track that really does well. It's a slow dance number, crunchy and cavernous, that is so delightfully interesting it makes for a great experience. The only downside is finding that two of the best tracks are buried halfway into the album, but rest assured that they are worth getting to. "Show Me Lights" continues that trend with raucous bass drums, crashing cymbals and overlapping vocals all set to a huge wall of consistent sound. One of the better written songs, lyrically, on the album, this one feels as much like a soul track as anything else. And despite a strong opening, "True Love" disappoints slightly once the vocals start. For all of its excellent musical merit, the lyrics lack depth. That's not entirely bad, but when the melody never escapes the music that greatly it leaves the whole song feeling a little bland. Still, it's as good or better than some of the earlier songs. "Pull Me Back To Earth," though is extremely interesting, overflowing with energy and sung over a plucky guitar lead. It builds and crashes and is mostly satisfying, though on repeat listens it becomes more enjoyable than the first time. "Chimes" and "Helpless" both have great moments, hitting on some beautifully paced dance and sweet, sincere, nearly-emo declarations of emotionality. But both of these, despite their notable moments of virtue feel a lot like some of the throwaway tracks from Friendly Fires. Sometimes, Pala feels like it has far more potential energy than it does kinetic. It strives for to be greater, bigger, and more memorable than it is, but it is nonetheless enjoyable. Built for party music, Pala will serve as an excellent, well beyond suitable backing track to any gathering, shindig, or chaotic dance breakdown. It's a solid album that begs additional listens, and I will say that after a few times through, the more ornate touches stand out greater than on the first pass through. Perhaps it's not an album that will always demand your direct attention, but it is an album that could soundtrack activities very well. And because every song has a special little surprise worth finding in it, whether it's a chorus or a buried bridge, there's a lot to look out for and forward to. Give it a listen below.